In the mid-90s, Euro-dance music made an impact around the world--and German-based pop duo La Bouche was at the forefront of the movement. Conquering the world with smashes like "Be My Lover" and "Sweet Dreams," both of which topped charts globally and landed firmly in the U.S. Top 5, the group seemed poised for stardom. Conflicts between superstar producer Frank Farian--the mastermind behind Milli Vanilli--and the group's record labels prevented La Bouche from following up on their success. When La Bouche released its sophomore set in 1998, the irony of the disc's name "You Won't Forget Me" was apparent--audiences seemingly already had. Now, in a YourMVP Magazine exclusive, Melanie Thornton, the voice behind La Bouche's record-smashing singles, speaks out about the road to the top, the pitfalls of success, and how she plans to rebuild her own career--as a solo artist with a new CD due this fall. YourMVP: What were your musical influences growing up? a fantasy of mine. When I was growing up my mother would listen to Aretha Franklin, Roberta Flack and The Temptations, a lot of the Motown music artists. I would mimic the female vocalists I saw on TV or heard on radio. They started to shape me vocally. From 12 years old on through college, I made sure I had vocal coaching. I wanted to learn to sing properly--and I just loved it. I was addicted to it. How did you go about turning your passion into a career? It was a hobby all through college. I frequented a club called The Peacock Lounge. I would get up and do jam sessions when the [live band] invited people up to sing. I did that for about a year. After that, I got a call from the band leader who said the lead female vocalist had left the group. He remembered me and [asked if I was] interested in taking her position. I jumped at it. It was just a cover band, but they had a lot of work. During the high season, they worked a good four nights a week. That was a lot of work for a working musician. I was still in college at the time, but I was loving it. That's how I got that drive in me to go as far as I could with professional singing. How were you "discovered," for lack of a better word? That's kind of hard. I think I was discovered over and over again all through the beginning. The first discovery was performing with that band. Second was when I went to Germany 2-1/2 years later. I had reached a point with the band where I wasn't growing as a vocalist, as an entertainer, and I had gotten bored. My sister was in Germany with her husband. They offered me an opportunity to come to Germany and work with her husband's uncle--"Uncle Bob". He said if I ever came over, he could get me work--and that's exactly what he did. He introduced me to a lot of musicians. I basically did freelance singing. Musicians that heard about me would call and I would go do gigs. First in jazz and blues, which was mostly the repertoire for the gigs Uncle Bob got me. That led to meeting small-time producers that were still banging out dance singles or playbacks in their basement studios. I did several studio sessions where for me it was just more income and fun work, new experiences, working in the studios, cowriting with producers on these dance songs. One of those was "Sweet Dreams." Ahhh . . . So that's how the whole connection with La Bouche came about? Did it just seem to happen for you so quickly after that? Yes. <pause> Actually, it didn't seem to. Looking back, it seems like it happened very quickly. In the process, it really didn't blow me away. Like I said, I was still gigging when La Bouche started. I did the studio session with ["Sweet Dreams" producer] Amir Saraf and Uli Brenner in November 1993. Meanwhile, I was gigging, making my money, earning my living. Two months later, they called and said a record label was interested in releasing "Sweet Dreams" as a single. The producer and owner of the label was Frank Farian, the producer of Milli Vanilli, and he wanted to meet me. There was not a lot of talk of, "Oh, this is going to be big." I didn't really get a sales pitch--that they wanted me to be part of this "fantastic group." It wasn't an "I'm going to make you a star" story. It was just, "We love this single. We want to release it and see what happens." So it was the start of La Bouche? And then you just exploded all over the world. Well, yeah--but first in Europe. <LOL> While we were on the road promoting and doing gigs, the song was pretty much moving up the charts and doing well in all territories--which allowed us to do more work, which was most important to us. We didn't really feel [like it "took off"]. We felt the success in the way that we were getting all this work. We were able to go out and play in so many places, and we were getting great, great responses. It was fast moving--but I don't know that we had the time to feel the success . . . you know what I mean? That we were these big pop stars. I didn't feel it anyway. I always felt like "Mel," but I knew that we were getting a whole lot more work and that we were being very appreciated by everybody that saw us. Which is very cool. When "Be My Lover" came out, it was basically the song of the year. It was inescapable. How did that feel--to hear yourself everywhere? It was great--but to me it was like a gradual thing. It was a very happy feeling. It was like, "Oh, wow! This is something I dreamed of when I was six years old." <LOL> But, at the same time, we were traveling so much. We really didn't have the time to soak in the momentum of our success--to soak in the hype and believe the hype. We were working really hard at this point. We would go places and people would go crazy to see us, and this was interesting. It was what we saw happen to Michael Jackson on TV . . . <LOL> It was really cool, really wild. At the same time, I kind of kept in mind, "This is really great. I hope we can continue to produce music our fans love." But I always tried to keep a reality check. "This is because this song is so widely publicized and promoted. And it IS a great song, but it's more about the product at this point than ourselves." What happened so that there was never any real follow-up on that initial success? <pause, thinking> It was pretty much political. Frank Farian held pretty much total control of the project and he had, since the beginning of La Bouche, picked up a whole lot of other projects. We'd been put on the backburner until he'd finished producing No Mercy [and others]. He did record a single called "Balingo" that was supposed to be the introduction of our second album, but it didn't work that way. It was like six months after the end of our first album and like a year before the actual release of the second album. ["You Won't Forget Me" finally came out in 1998.] It wasn't supposed to be that way, but it's just the way it happened. Basically it was just waiting on Frank Farian. First to be ready to start producing and then, second, to be satisfied with the work. There were also power struggles going on there. I would have to say a lot of it was disagreements between Frank and the labels. During the five years it's been since the major impact of La Bouche, what have you been doing as an artist to keep yourself busy, preparing for this solo effort? bought a house and gotten married. Actually, [within the past year] I got married. Thank you! But mostly I've been preparing for the solo album. Writing, meeting more and more producers--here in the U.S. as well as in Germany. Working with them, collaborating with them, getting ideas together. So far we've come up with a lot of great stuff--stuff that we think is great anyway. Putting together a package, a product that will take me farther, will define me more as an artist and hopefully allow my fans to accept me as a solo artist. How are you working to differentiate yourself from La Bouche? I can't change my vocal style--but we are changing the music. It won't be Euro-dance. Although it will be danceable, it will be directing my music more toward the pop audience. We have danceable tracks, more ballads--we'll be doing more ballads than we did with La Bouche. We'll set me up as a pop artist. I'll have a new image. No, no more braids! <LOL!> Actually, I've cut my hair. I have a nice, sharp style. 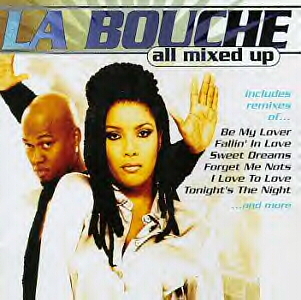 I don't want to disassociate myself from La Bouche. I think La Bouche was a wonderful opportunity--and part of me is La Bouche. But I don't want to . . . how do I say? I don't just want to continue to be a dance artist, trying to be young and trendy, like dance artists have to be. I want to just be myself and not have to conform, you know? I don't really want to be totally specific. I want to leave some element of surprise! Have you named the project yet and is there a release date? No, it's not titled yet. I will be Melanie Thornton coming out as Melanie Thornton. In Germany and Switzerland, the projected release date for the first single will be late October. Is it going to be uptempo pop--or a ballad? Something to differentiate you from the very beginning? Who are you working with to produce this? Yes, it's going to be more of a ballad. I'm working with a group of producers both in Germany and in the States. We're in a toss-up between these two producers right now--they're not big names, so I don't want to disclose their names right now. What promotional efforts have you planned to get the word out that there'll be a Melanie Thornton CD out there? We're locking down on a huge TV campaign in Germany right now. We're actually viewing it as starting fresh again. Starting this new solo career is almost like starting brand new. First we have to get the people to not only remember the voice of La Bouche but to also appreciate it in its own right. We're locking down a big TV campaign with Coca-Cola in Germany for the holidays--for the Christmas holidays--on their biggest television network. It'll be in time for the holidays with the ballad. Actually, the State-side will depend on the success of the European release, so there are no projections yet. We hope that it will go and a State-side label will pick us up. Maybe Sony Epic in the U.S. will want me--I'm hoping and praying that this happens. <LOL> But, as of yet, we can't really tell until we have feedback on the German release. You are doing club appearances in the U.S., though, aren't you? Actually, yes. I do club appearances--but not many. 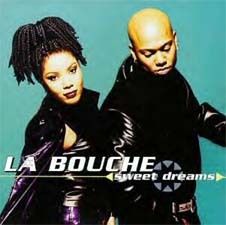 La Bouche has gone on--they have a new singer, so I can't really [go under] the name of La Bouche. Though as long as the promoters know that this is the situation and they're cool with it, I do shows. They promote me as "Melanie Thornton, formerly of La Bouche." What do you want from this first solo effort? Basically, I want to build an audience . . . a fan base so that I can perform. This has been my ultimate goal from the very beginning. My love is performing on the stage and being able to do my own music, music I write, or music I've collaborated on with other writers. And to be able to work until I'm 60. <LOL> The stage is really my home--I enjoy it. If I have the opportunity to gain such a big fan base like this, as is in the recording industry, then I'm going for it. If it doesn't work, I'll be in the clubs. I'll be doing galas. Hell, I might go to Las Vegas. But my whole thing, my whole reason for doing this is to gain a fan base, an audience, that will come and see me sing.